Public transportation plays an important role in providing a comprehensive transportation system and is essential to achieving the Vision. It provides an alternative mode of transportation for motorists and a primary mode for the transit dependent. Though the development and operation of most public transit services and facilities are outside the City’s authority, the City actively promotes transit through sound land planning, urban design, and active participation in regional transportation agencies. 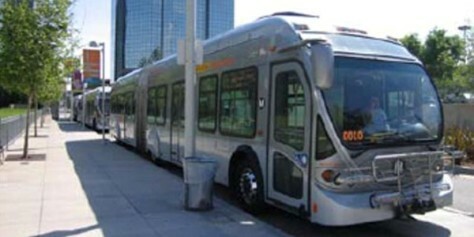 Elements of such a system in Ontario could include more extensive and frequent basic local bus service, higher-speed bus rapid transit corridors for longer trips, more Metrolink trains that connect to other regional hubs, convenient transfer centers, light and high speed rail, feeder and distribution systems, and future land use patterns that are more suitable for transit users. A public transit system that is a viable alternative to automobile travel and meets basic transportation needs of the transit dependent. Transit Partners. We maintain a proactive working partnership with transit providers to ensure that adequate public transit service is available. Transit Facilities at New Development. We require new development to provide transit facilities, such as bus shelters, transit bays and turnouts, as necessary. Transit-Oriented Development. We may provide additional development-related incentives to those inherent in the Land Use Plan for projects that promote transit use. Bus Rapid Transit (BRT) Corridors. We work with regional transit agencies to implement BRT service to target destinations and along corridors, as shown in the Transit Plan. Light Rail. We support extension of the Metro Rail Gold Line to Ontario, and will work to secure station locations adjacent to the Meredith site and at the proposed multimodal transit center. Metrolink Expansion. We advocate expansion of Metrolink service to include the Downtown and the multimodal transit center. High Speed Rail. We encourage the development of high-speed rail systems that would enhance regional mobility in Southern California and serve the City of Ontario. Feeder Systems. We work with regional transit agencies to secure convenient feeder service from the Metrolink station and the proposed multimodal transit center to employment centers in Ontario. Ontario Airport Metro Center Circulator. We will explore development of a convenient mobility system, including but not limited to shuttle service, people mover, and shared car system, for the Ontario Airport Metro Center. Multimodal Transit Center. We intend to ensure the development of a multimodal transit center near LAONT airport to serve as a transit hub for local buses, BRT, the Gold Line, high-speed rail, the proposed Ontario Airport Metro Center circulator and other future transit modes. Transit and Community Facilities. We require the future development of community-wide serving facilities to be sited in transit-ready areas that can be served and made accessible by public transit. Conversely, we plan (and coordinate with other transit agencies to plan) future transit routes to serve existing community facilities.